I saw ‘Rogue One’ this weekend and LOVED it! 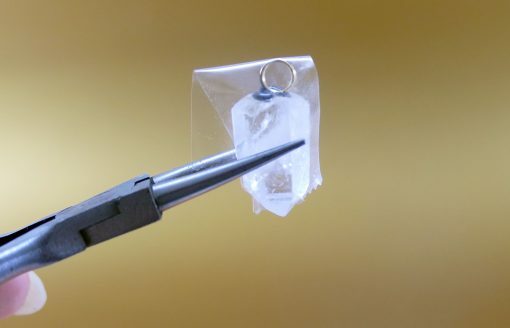 I was particularly captivated by Jyn Erso’s crystal necklace, given to her by her mother with the reminder to “Trust the Force.” I’ll admit to being a bit of a Star Wars nerd and I think she received a Kyber crystal, which is a powerful, Force-attuned crystal used in both lightsabers and the Death Star. I believe Jyn Erso’s Kyber crystal is significant to the story, though I’m not yet sure how. What I know is that really want one of these crystal necklaces! So I went to a rock shop to find my own crystal and made a Kyber crystal necklace like Jyn Erso’s. You can make one, too! Of course, you may not be at all interested in re-creating Jyn’s necklace, and that’s cool, too. 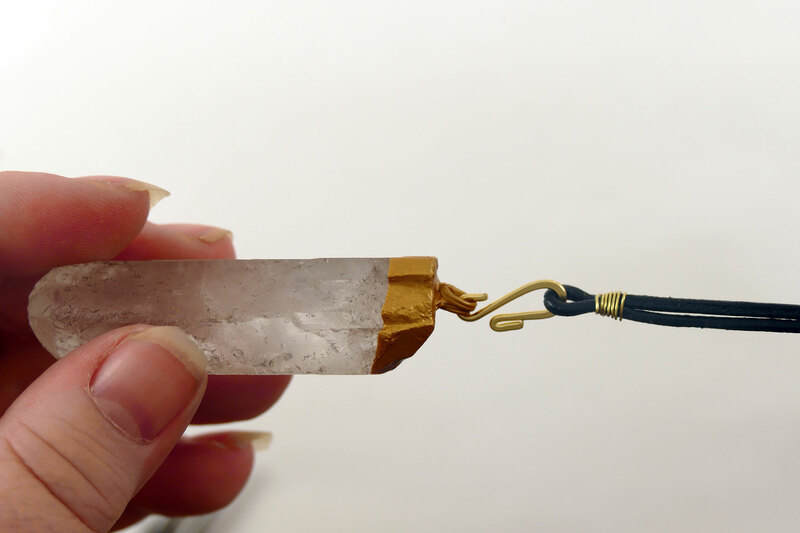 This is actually a great tutorial on how to make a DIY “gold” dipped crystal pendant, as well as a tutorial on wire wrapping leather cord. You can use these techniques to make beautiful jewelry! 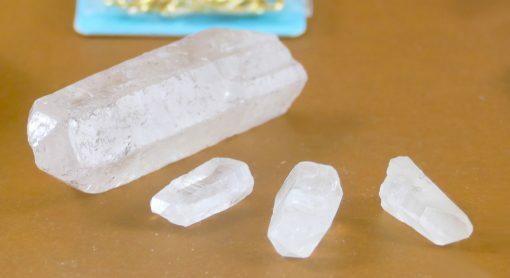 I experimented with different sized crystals. The small ones here are about 1 inch long. The large one is a little over two inches. The big one is rather large, but it looks more like Jyn’s crystal. I was able to purchase the small crystals at my local rock shop for 30 cents a piece, while the large one was $5. Step 1: Wash your crystal and locate the end at which you want to hang it. 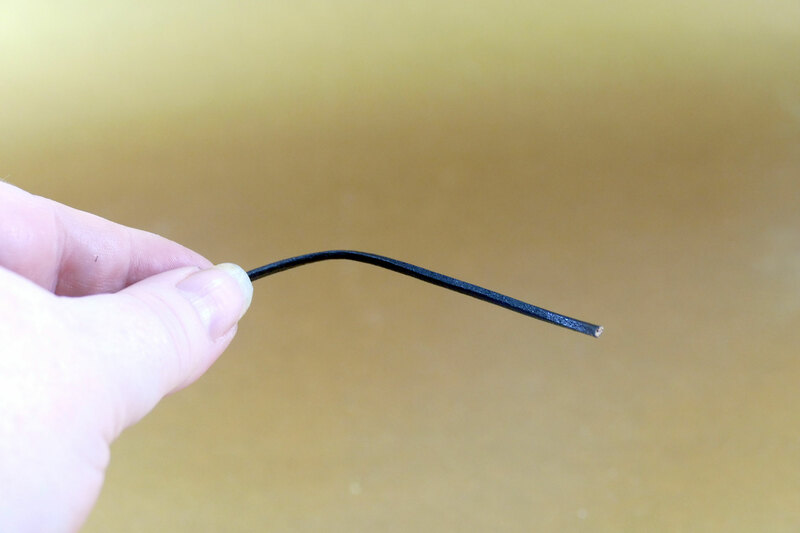 This is usually the flat end, so the pointy end hangs down. Dab the flat end with the E6000 adhesive. Place the jump ring in the adhesive, positioned properly. Step 2: This is the hard part. You must wait 24 hours for the adhesive to cure. Do not say to yourself, “Oh, this looks like it’s set already. Let’s just paint it right now.” Your adhesive won’t set properly if you do this. (Yes, I tried it! This is why you have me to make the mistakes first!) 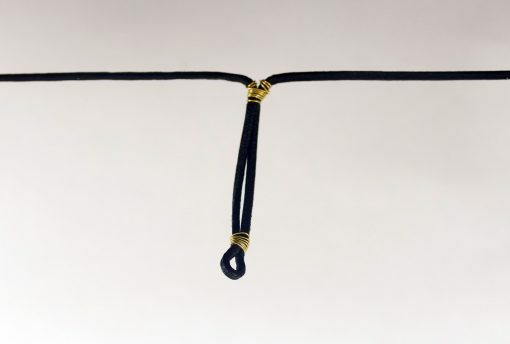 You may want to put a piece of tape over your jump ring to hold it in place. While the adhesive is drying, you can work on the necklace. 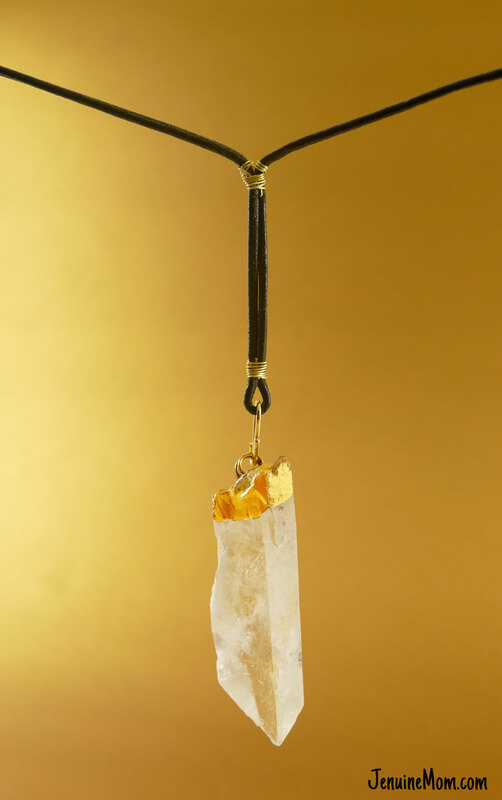 Step 3: Put the leather cord around your neck and allow it to hang where you’d like your crystal to hang. Jyn’s necklace looks fairly long — I’d say at least 18-20 inches long. Determine your length, then add an extra five inches to it. Step 4: If you look at Jyn’s necklace, you’ll see there’s a part that hangs down from the main necklace. We’ll make this part first. Fold your leather cord in half to find the center and pinch it together tightly. 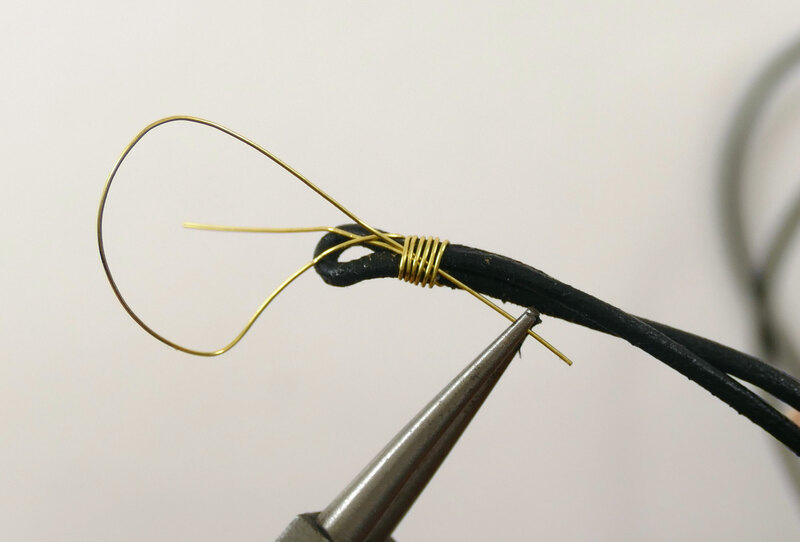 Now cut off a 6 inch piece of brass wire and place the tail end of it in the fold of your leather. 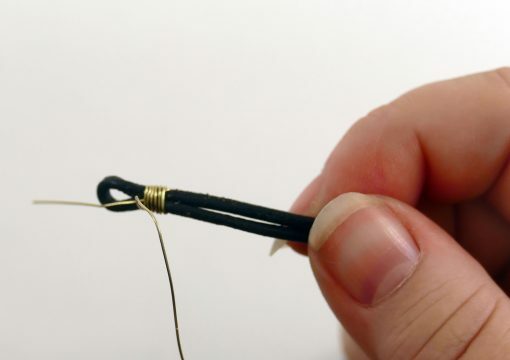 Step 5: Holding the leather and brass wire well between two fingers, begin wrapping the wire tightly around the leather cord about 1/2 from the end, moving toward the pinched end. Step 6: When you get about seven wraps in, push the end of the brass wire back into the wrapped section and pull down. 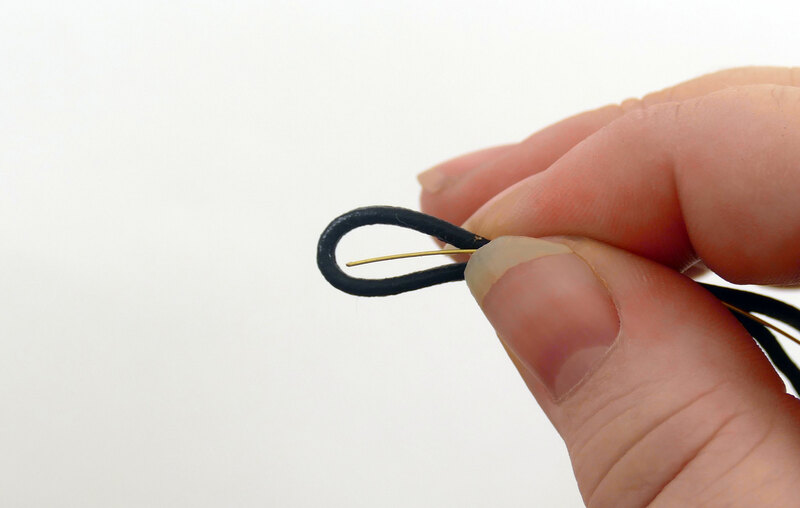 Use your needle nose pliers if necessary to pull it all the way through. 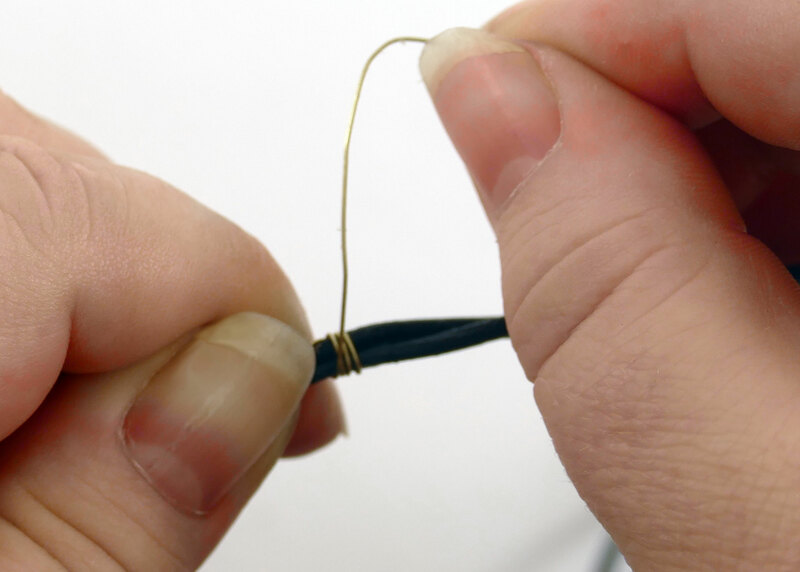 This essentially knots your wire in place. 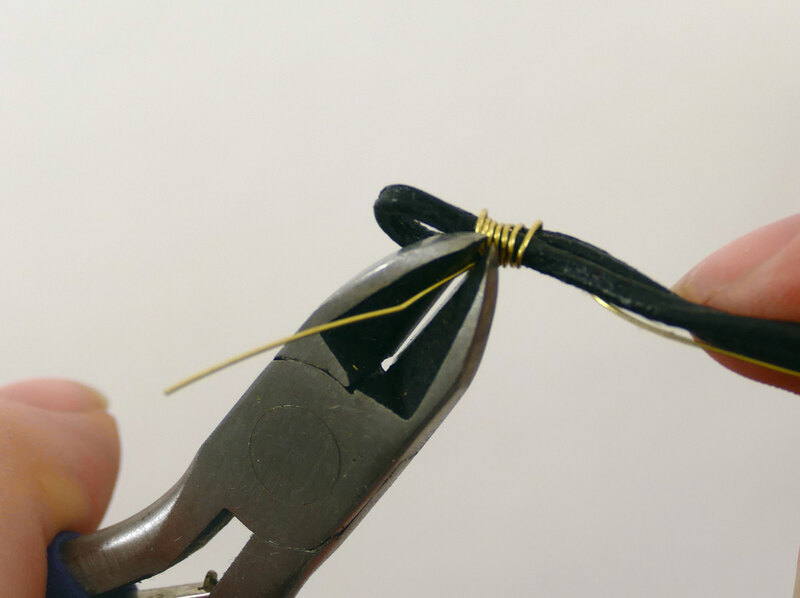 Step 7: Trim the ends of the brass wire closely with your end cutters. Step 8: About two inches from the end, do another wire wrap. 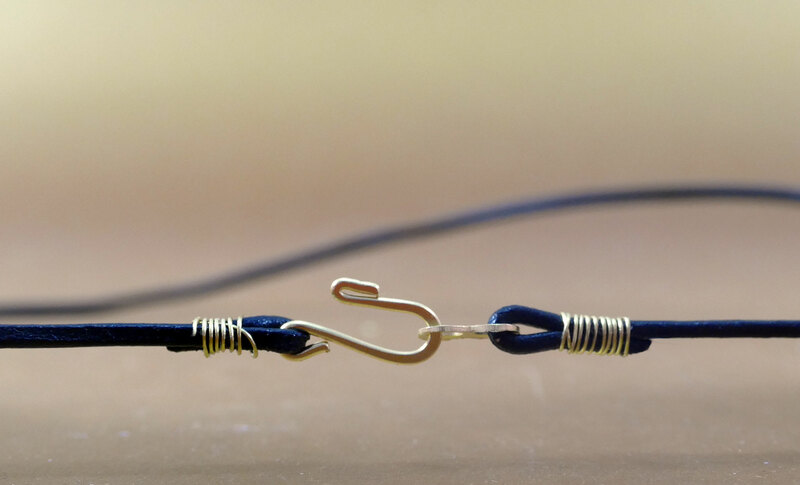 This time you’ll also want to do some extra wraps around each individual cord — I found this helped the necklace look more like Jyn’s and also stabilizes the wire. Step 9: Put the leather cord back around your neck (with the ends of the cord touching behind your neck) to check it’s length again. You want it to be just one inch longer than desired. 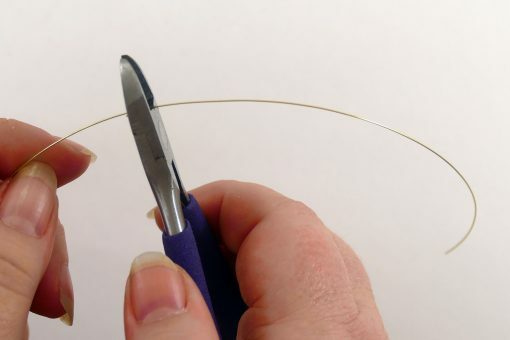 Trim if desired, but make sure you have an even amount of cord on both sides. Step 10: Attach each clasp part to the two ends of your cord using the same wire wrapping method we used earlier. 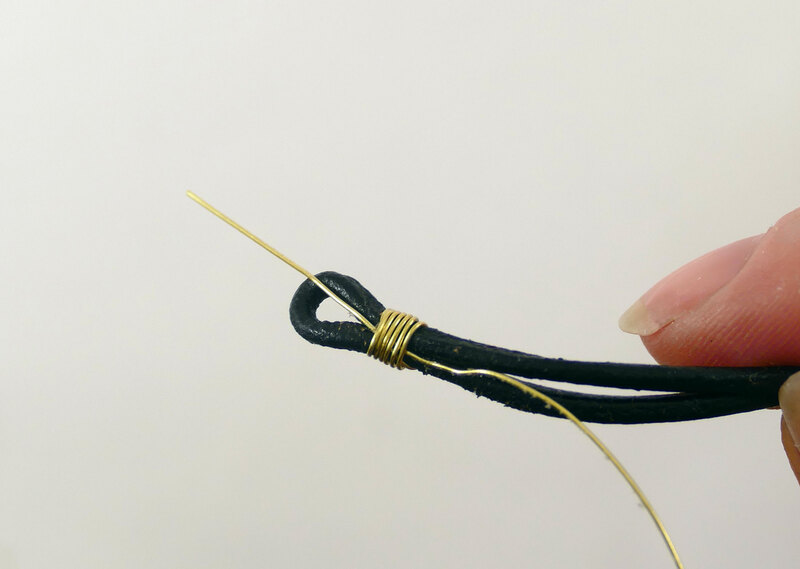 This time, you’ll put the leather cord through the hole of the clasp first, then wrap the wire around the leather to secure it. Be sure to trim the wire ends when you’re done. Step 11: Once the adhesive is cured, dip the top of the crystal into your gold paint so it goes in far enough to cover the jump ring, the entire flat end, and a little extra. If your crystal is small enough, you can just dip it in the bottle. If it’s too big to fit, pour some into the cap or a little bowl. Allow 1-2 hours for the paint to dry, depending on how much paint ended up on your crystal. 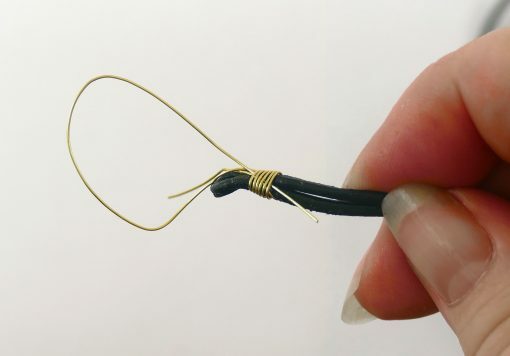 Step 12: Once your paint is dry, attach a jump ring or another connector to your crystal and attach it to the bottom of your cord! 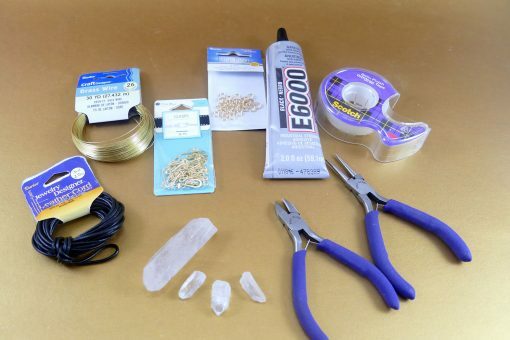 I think this is a great beginner project to jewelry making. And the results are amazing! This turned out to be a really stunning necklace. And it would make a great gift! Did you know quartz crystals are believed to be a “power stone.” Some believe that quartz enhances thoughts, amplifies energy, and can energize you. This makes it a perfect stand-in for a “Kyber” crystal! 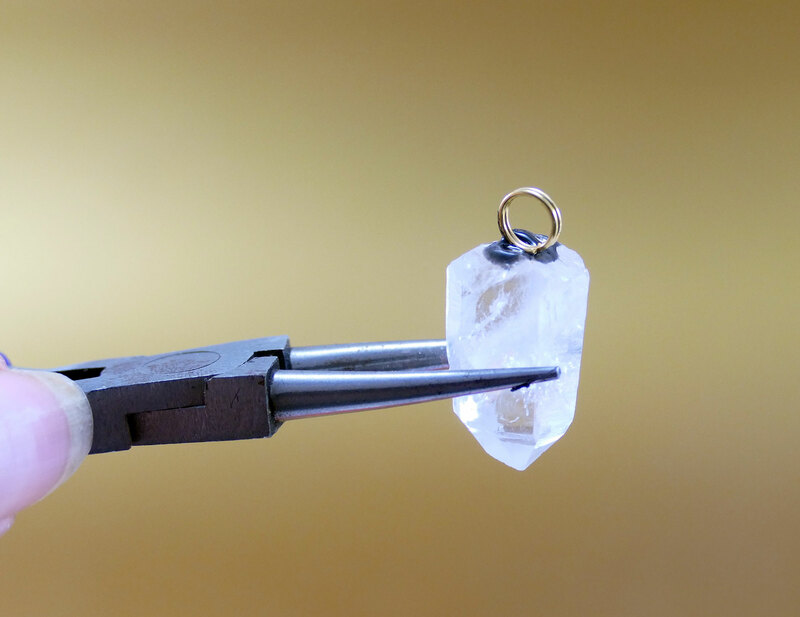 Quartz can be super clear or have veils, bubbles, inclusions, and various colors. In Star Wars lore, the Kyber crystal is described similarly. The Kyber crystal’s combination of transparency and opacity was known by Jedi as “the water of the kyber” (see Kyber Crystal | Wookiieepedia). P.S. Check out my other fun DIY gift tutorials to help you make wonderful homemade and inexpensive gifts! I currently have tutorials on DIY teacup candles, DIY Sharpie mugs, DIY hand warmers, and DIY bath bombs! Like this tutorial? Pin it! I definitely want to try this! We get to go on one of the new Star Wars tours at HS in January, and it would be fun to wear it for that! Awesome, Megann! Let me know how it turns out! It would be awesome to wear at Disney, too! This is beautiful! Great DIY instructions too! Wow, that is easier than I would have thought. I love how it came out and this would make a wonderful gift idea. Yeah, it was easier than I thought, too! Thanks, Robin! Who knew you could make these yourself. Love gold dipped anything. This is so pretty! I love handmade jewellery and tend to buy quite a lot of it. Handmade necklaces always look so much more unique and special than shop bought ones that thousands of other people might be wearing. What a cool necklace! I bet my husband is going to like this! I’m going to show this to him. This is such a fun and beautifully unique necklace. It would make a great gift for my mother if Christmas wasn’t in just a couple days. I’ll keep it in mind for Mother’s Day. Thank you! I think Mother’s Day would be a great occasion for a gift like this! We love Star Wars, so I know my kids would enjoy this craft. Thanks for the step by step guide. You’re welcome! I’m happy you enjoyed it! I am not so much of a fan of Star Wars but boy I loved this necklace!! Looks very delicate and cute. I might try to make one for myself 🙂 Thanks for the detailed steps! We are going to see this on New Years Day! I can’t wait and this necklace is such a great idea. I want to make one for myself! Yay! Have a great time at ‘Rogue One’! This is super pretty. I’m not sure when or if we will be seeing this movie but this is a lot of fun! This is such a cute necklace! I bought one similar and it was so expensive! I love the idea of making it on my own!! 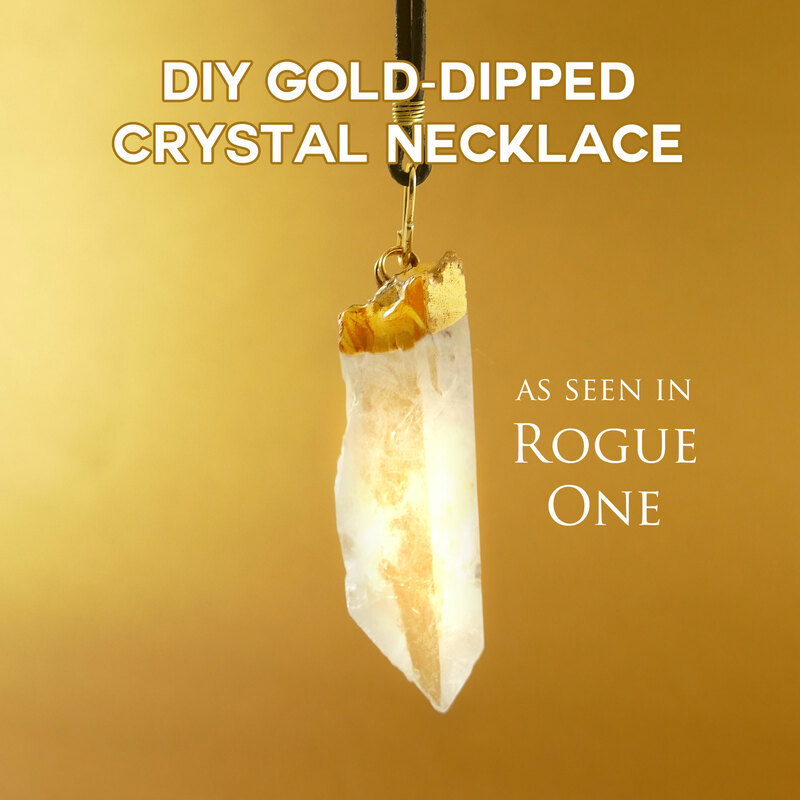 This necklace looks just like the one in Rogue One. I can’t believe how easy it is to make and how authentic it looks. I have not yet watched the movie, but this tutorial is fabulous! I love the end result! Wow! I really love this! I didn’t see Rogue One yet, so I am not familiar with this necklace, but I want one!!! This crystal necklace is beautiful! Love that you used inspiration from Rogue One to create a charm like this one. 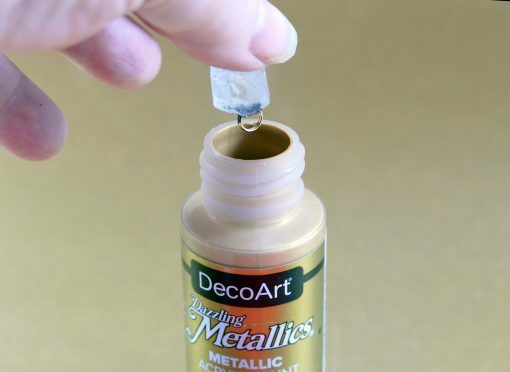 I had no idea you could just use paint for that gold foil look! I LOVE it! Thanks so much for sharing! Yeah, this gold metallic paint does a great job! Wow, this is awesome!! As a fellow nerd, I love to wear outfits, hairstyles, clothes or jewelry inspired by my fandoms. (Hence the reason I’ve been wearing my LOTR Evenstar necklace with pretty much any outfit lately.) So this is totally going on my list of imminent projects! 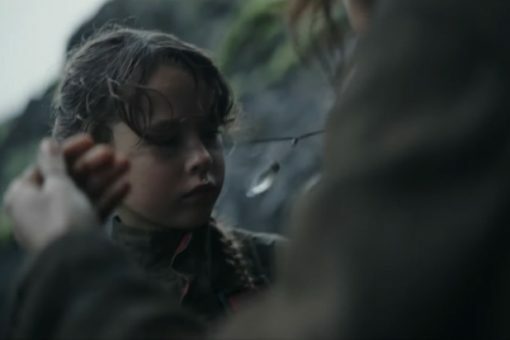 Just a cool note: have you noticed that if you look carefully at Jyn’s pendant that there’s a some sort of engraving down the side? Take a look at the model pics from the Star Wars official site, and you’ll realize that Lyra had engraved the phrase “Trust in the Force” on the crystal in Aurebesh!! I would love to find a way to replicate that on my ow version, though I’m not sure how hard it would be…. May the Force be with you always!! I definitely want to try this one! This is perfect for a gift. Instead of crystal I would like to make it with birthstone. Do you think it will work? Sure, I think that would work great!